The Digit-al Dozen DOES Childhood, Day 1: Power Rangers! Good morning, readers! It’s time for this month’s Digit-al Dozen nail art week! The theme is Childhood and I can’t wait to see the versatile manis from the group this week. This is such a fun theme and it can go so many different ways–from things reminding us of our own childhoods, things that remind us of our own children, things that are just child-like in general, etc. My first mani is inspired by a tv show that has been around for YEARS, with many different series themes. It’s the Power Rangers! It debuted in 1993 and you can find 20+ seasons on Netflix today. My kids, Hailey (6.5) and Owen (2.5) are obsessed with them. They pick Power Rangers more often than any other show during their tv time–and their favorite series is Power Rangers Samurai. 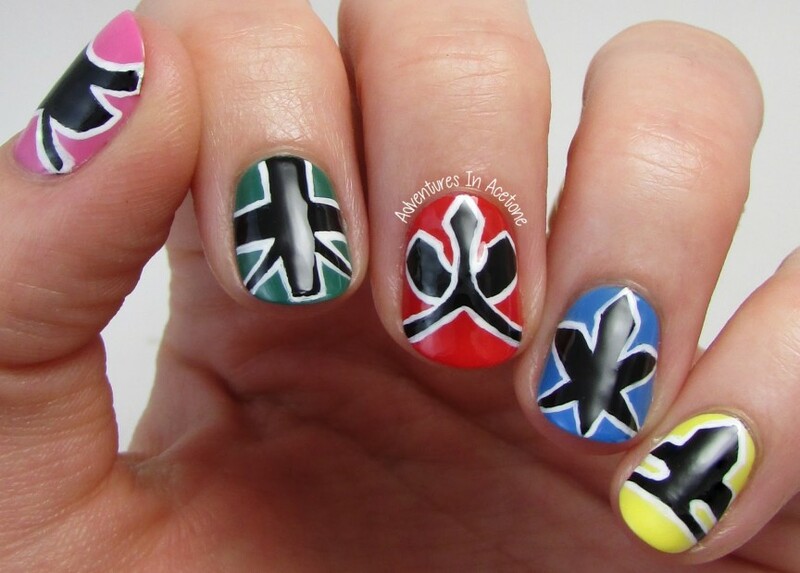 I’ve recreated the 5 main Samurai Power Ranger helmets on my nails for today’s look. I used Rica Whiteout and Blackout for the details and my Pure Color Glamor #1 nail art brush (which is my current favorite!!). KBShimmer Clearly On Top was the top coat used. What do you think of these? Are you a fan of any Power Rangers series? Which is your favorite? Thanks so much for reading! Come back tomorrow for the next Childhood Week mani with The Digit-al Dozen. Take a peek at what the other ladies did for Day 1 below! After seeing this mani I'm sad that I never watched Power Rangers. That's the problem with being from the country where we couldn't get cable. The boys are obsessed as well – I think Super Samurai is the fave at the moment but it changes so often I can't keep up! Oh my lanta! I had no idea they still had the Power Rangers on TV! My son loved this show and we had so many Power Rangers toys it wasn't funny! First of all, I love how you translated all the symbols! I had no idea that Power Rangers was still on tv — I was OBSESSED when I was a kid! I didn't even know there were different versions of Power Ranger, like those Samurais. I remember I used to watch them on Saturday mornings, which were my "TV time" when I was a kid. These are awesome! I loved the Power Rangers as a kid, but in my day they were the Mighty Morphin Power Rangers. I don't know anything about the Samurai ones! Bright and colourful! I'm not overly familiar with the Power Rangers myself. This is so crisp and clean! Your lines always amaze me! Great job! Love this!! I loved watching this show when I was growing up; and obviously the Pink Ranger was my fave! Rangers came out just after my age group, but I've had lots of experience with my own son loving it. My brother used to watch this show everyday without fail!! The nails look amazing! My kids totally loved the Power Rangers! I love how you translated it to your nails.